Rose Hip Oil and More! Homemade Soap Recipes! Rose hip oil is cold pressed from seeds of the Rosa Rubiginosa. This wild rose species, (shown right), is native to Europe and western Asia. 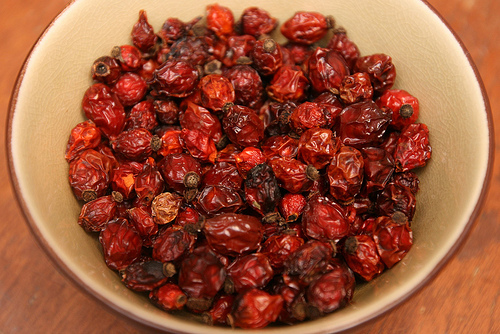 Rose hip, unrefined oil, has a deep orange-red color. A refined oil has a pale, golden, color. It's light in texture with a mild, earthy, aroma. It's known as the "oil of youth". It's used in cosmetics, skin and hair care products. For the highest quality look for pure, organic, extra virgin oil. Rose hips are the fruit of the rose. They're the seed pod left over after the petals fall off the flower. 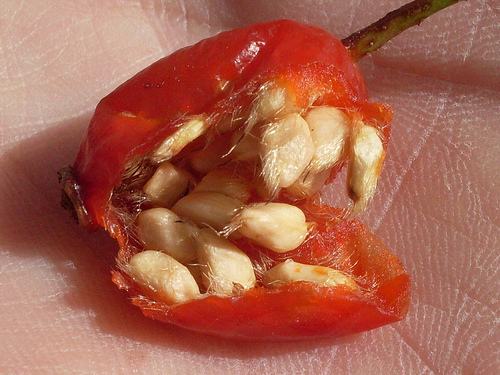 The seeds are removed and the skins are used as edible portions. CAUTION! Do not eat rose hips whole! They have small, irritating, hairs inside the berries. Eating the hairs could be a choking hazard! Hairs are removed by filtering or by cooking. Rose hips are a nutritious food source in: tea, soup, puree, jelly, marmalade, syrup, wine and more. Varieties differ in flavors. ROSE HIP NUTRIENTS: lycopene and beta-carotene, (powerful antioxidants), good amounts of vitamin E and vitamin K. High amounts of natural vitamin A, (retinol) and vitamin C. They have have thirty times more vitamin C than oranges! Has essential fatty acids Omega 3, 6 and 9, especially high in Omega 3 and Omega 6. They have plant flavonoids, calcium, magnesium and other nutrients. ANTI-AGING: Slow skin's aging process. Combat free radicals with antioxidants. Regenerate new skin cells. Increase collagen and elastin levels. Fade fine lines and wrinkles. Improve skin tone and pigmentation. Fade age spots, sun damage and discolorations. This oil is slightly astringent. Discover a firmer more youthful appearance. Strengthen tiny capillaries. Diminish varicose veins. HYDRATE: Absorbs into skin quickly without greasy residue. Restore moisture and softness. Relieve dry itchy skin, dermatitis and eczema. Gentle for sensitive skin. ACNE SCARS: Diminish acne scars. Reduce the size of pores. Smooth skin. Most effective on new scars. Still beneficial for older scars. Acne scar will begin to fade and elasticity will restore to skin. Remove redness and irritation. Reduce inflammation. Improve skin texture and tone. CAUTION! Do not apply rose hip oil directly to acne. Do not apply to open wounds. It can aggravate acne or open wounds. Do not apply to acne prone or very oily skin, as it can worsen the condition. CAUTION! Rose hip oil will not protect against sunburns. Rose hip oil is generally classified under essential oils, but it's not strictly an essential or volatile oil. It's used as a carrier or base oil in aromatherapy. It doesn't need to be diluted before using on skin like other essential oils. It's usually blended, in a small dilution, with other carrier oils or essential oils. Blends well with Bergamot or Grapefruit essential oils. It works well as a facial oil or body oil. It works well under make-up. If desired, add a couple drops to lotions, oils or creams. SHELF LIFE: Approx. 1 year unopened. Approx. 6 months after opening. Adding vitamin e oil helps prevent rancidity and can increase the shelf life. STORING: Can go rancid. Store in cool, dry, dark location. Store in dark bottle. Can be refrigerated. Rose hips come from different species: Rosa Rubignosa, Rosa Rugosa and Rosa Canina. They're all used for making homemade soap. They come in powder, dried leaves or oil forms. ROSE HIP OIL TIPS: This oil can be expensive, so use it sparingly. Add it to base oils at the beginning of your soap making process. You may rather add it as a superfatting nutrient before adding essential oils and other additives. It's commonly used from 2% to 10% in soap recipes. ROSE HIP POWDER AT AMAZON! Grind dried rose hips, finely, to make powder. It's granular texture is a mild to medium exfoliant. In cold process soaps, the red berry will produce an earthy red color. The seeds will result in shades of brown. Depending on your choice of soap color, you'll need to separate the berries from the seeds. Soap colors may fade to a pinkish-brown. Rose hip soap can have a speckled appearance. POWDER TIP #1: Separate the seeds and little hairs, (pith), from the flesh of the berry. (You may want to wear close fitting gloves in the separation process, since the little hairs can be itchy to skin.) Place berry flesh in oven on low heat until completely dry. The drying process may take about 3 hours. Remove dried rose hips from oven. Turn off oven. Let rose hips cool. Gradually place dried rose hips in sifter. Sift dried rose hips to a fairly fine powder in container. The sifting process will continue to help remove the tiny, itchy, hairs. Use it sparingly in your homemade soap recipes. POWDER TIP # 2: The Japanese rose hip, (Rosa Rugosa), is much better to use when making powder. The Dogwood rose hip, (Rosa Canina), is very small. It takes a lot of time and effort separating, cutting and cleaning. The end result may not be worth all of your effort. Dried ground tea leaves can be used in soap recipes. Brewed tea can also be used. Rose hip tea is an herbal tea. Rose hip tea made with petals and leaves, from the Rosa Rugosa, has a delicate floral flavor. This tea, made with the hips, is more sharp and citrus flavored. ROSE HIP TEA RECIPE: Boil 1 cup of water. Place 2 heaping teaspoons of chopped rose hips in pot. Pour 1 cup of boiling water into pot of rose hips. Let soak, covered, for 15 minutes. 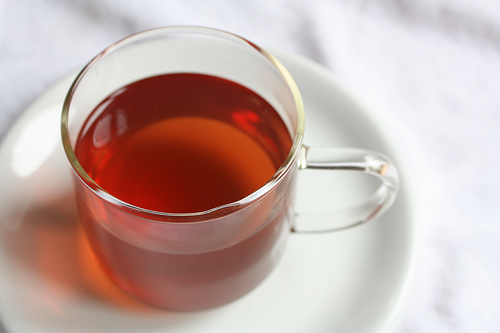 Strain tea in cup or container. Rose Hip Oil…… 3 oz. Palm Kernel Oil…. 8 oz. Lye…… 6.98 to 7.21 oz.